Student: What is the significance of putting the thumb with other fingers? Thumb represents Prana – our life force. If there is no life in the body what is the use of the body? Similarly, if thumb is not used, no Mudra will be activated. Prana means Universal Life energy. Except for special Mudras, for all mudras, one had to keep the mudra on both the hands. 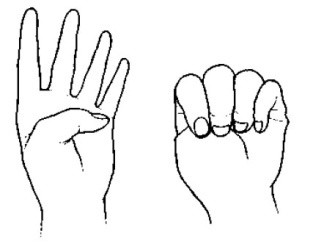 You can chant mantra or switch words silently, while doing the mudra. You can walk, lie down, sit down or watching TV while doing the mudra. There is no time to do mudras. You can do it all the time. Of course, they are very effective when you do the mudras between 4-6 AM. In general, Mudra you can do for 30-45 minutes, Mantra can be done all the 24 hours. There are exceptions to that rule. Don’t do Linga mudra for more than 15 minutes at a time. However mudras like Chin Mudra and Acceptance mudra can be done throughout the day. All mudras are beneficial to us without any side-effects. However, for some it might produce an unwanted side-effect. In such a case, please stop doing it and contact Naran. You need not press the fingers hard when you touch the tip of the thumb or while placing them at the base of the thumb. No pressure should be applied. Pressure means, your mind is restless and not stable. The above points were discussed during the workshop on Mudras, Hyderabad, on 16thFeb, 2013. You can learn about Mudras in the upcoming workshop, dated 15th Dec, 2013, at Bangalore, by Naran S Balakumar.